In the wake of the recent announcement by Texarkana Republican George Lavender that he wants Texas to become the next open carry state, the media is starting to take notice. Lubbock radio station KFYO has posted a poll with the question “Should Texas Allow Open-Carry for Handguns?” It should come as no surprise that pro-open-carry answers are dominating the poll. But we need to make sure that politicians continue to hear the message that Texas is tired of being one of the last states to recognize that open carry is an inalienable right as well as good public policy! Click on over to the poll and add your voice. 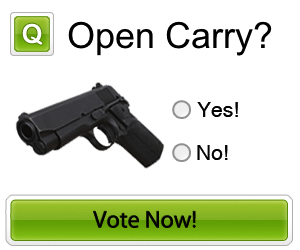 This entry was posted in Open Carry, Polls, Texas. Bookmark the permalink.